Family friendly rental - close to Seaside! Come relax in this convenient ground floor 2-bedroom 2 bath condo in Beachwood Villas. Decorated in subtle hues you will feel stress free as soon as you arrive. New granite counter tops and an open floor plan, makes cooking while entertaining your family and friends in the living area quite enjoyable. The living room is a cozy place to gather for board games or to catch your favorite TV show or movie on the Smart TV. Feel free to log on to your Pandora and Netflix accounts; just remember to log out before your departure. (Hint: Redbox kiosk is conveniently located at the Tom Thumb across from the beach access). Take advantage of the local shops and restaurants many of which are within walking distance. There's a public beach access conveniently located across the street for a leisurely walk to the beautiful white sand and crystal-clear waters of the Gulf of Mexico. Beachwood Villas also has 2 pools (one is heated seasonally), tennis courts, shuffleboard and an outside play area for the kid-o's along with plenty of green space! Feeling adventurous? Rent a bike and jump on the 20-mile bike trail that runs along scenic highway 30A and visit famous Seaside and Grayton Beach State Park. * Parking for 2 cars. 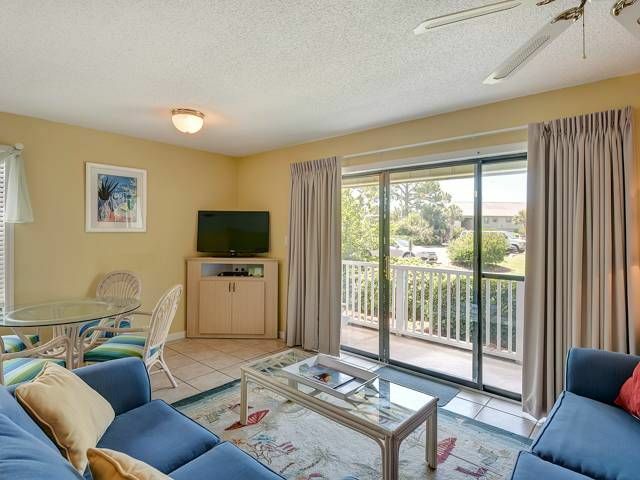 Nicely decorated unit across the street from the beach. Unit is in the back of the complex on first floor so can be noisy. Great location close to Seaside and Seagrove Beach. Amenities met but updates definitely needed— especially guest beds which are uncomfortable and make horrible noises with the slightest movement. Being located on the ground floor was appreciated. Great clean location. Has all the amenities needed. The kids felt comfortable and we had a great time! !